We have established Quality Education Nepal as a project in Australia to improve the quality of education in rural Government schools in remote areas through comprehensive teacher training. After using the existing NGO REED Nepal to deliver our training for three years we established LEARN ("Lifting Education, Advancing Rural Nepal") as a Nepalese NGO to deliver our training into the future. Please select Training reports from the drop-down menu to download reports of training courses delivered since 2011. From Chalk and Talk . . . 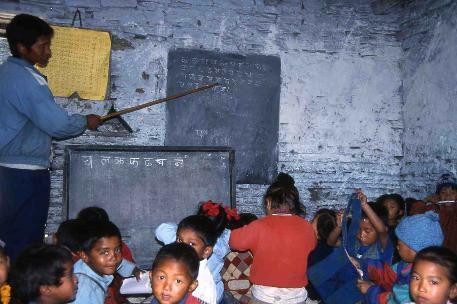 Facilitating education of children in rural Nepal has been a goal since Peter Hall's trek in 1993. This focus has intensified with the introduction of a Teacher Training program in 2011. Around 40 teachers from six schools of the Shikha VDC (Village Development Council) in Myadgi District received training provided by REED (Rural Education and Environment Development) in that year. The same group of teachers undertook similar training programs in 2012 and again in 2013. After three years of effort they are now well-trained teachers, able to deliver much better education to the children than previously. 40 teachers of neighbouring Ghara VDC began in April 2014 and another for 75 teachers of Rima Resource Centre commenced training in 2014 and all have now completed their three year programs. In April 2017 the training of another 75 teachers of Tatopani began, funded by a Rotary Foundation Global Grant project. And in June 2018 yet another 75 teachers of the Pakhapani area will commence their training.